Major WW3 False Flag Underway? 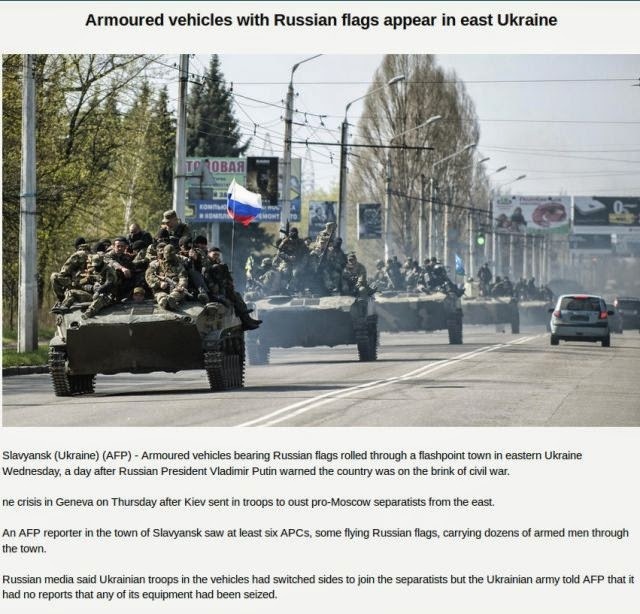 Russian Tanks Enter Eastern Ukraine Reports AFP — Or Are They? While social media has been flooded with reports of Russia invading eastern Ukraine due to pictures and videos like those seen below, the truth is the color of ones’ flag often misleads. AFP picked up the story as seen in screenshot below videos claiming Russia HAS invaded eastern Ukraine. TruthTube451 (AKA MrGlasgowTruther) asks in the 2nd video below, “are Ukrainian forces flying ‘false flags’, or did Russia just invade the Ukraine? You decide.” RT reports in the 1st video that Ukrainian troops in Eastern Ukraine have defected to Russia and that the AFP story of Russia invading eastern Ukraine is false. Will the press in America pick up the AFP story of Russia invading eastern Ukraine as true? Is this a set-up for a more active role for the US in the Ukraine?